Are You Ready to Accelerate Employee Engagement for Your Company? Employee engagement is a powerful tool for companies looking to increase profits, drive innovation, retain talent and energize the workforce. While the process of implementing a better plan for engagement can often take some time, there are three actions any organization can take to accelerate the process on every level. 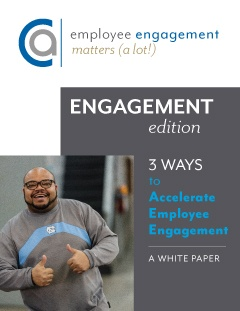 In our FREE White Paper, Three Ways to Accelerate Employee Engagement, C.A. Short Company takes a look at how your organization can: best select the right people; develop employees’ strengths; and enhance employees’ well-being. How you can develop employees’ strengths to increase your bottom line. The connection between engagement levels and physical health. Request your Three Ways to Accelerate Employee Engagement White Paper now by filling out the form on this page.